Stacked cakes, such as wedding cakes, are created when different-sized cakes are placed directly on top of one another. Stacked cakes and cakes with columns or tiers can be very dramatic and beautiful but, certainly, require a firm foundation and the correct accessories for success. A multi-tiered cake without the proper foundation is doomed, most likely resulting in ruined decorations, uneven layers, and potentially a completely collapsed confection. 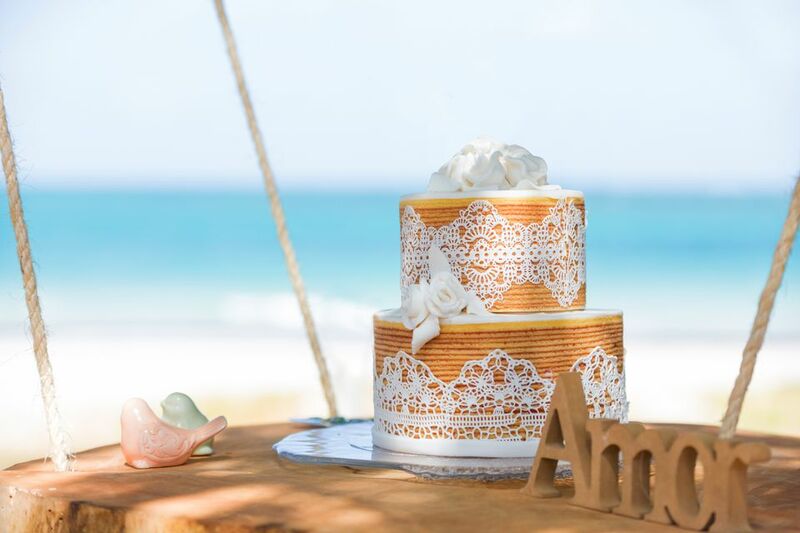 No matter how many cakes you are layering, from 2 up to even 8 tiers, it is best to have at least a 2-inch to a 4-inch difference in the diameter of each tier to create the best look. Stacked cakes, especially very tall ones, must be stabilized to avoid tipping, sliding, or even caving in. One way to secure the cake is to use individual cake boards and dowels in each tier. This makes it easier to transport the cake from the kitchen to the celebration—the tiers can be kept separate for transport and then assembled at the venue location to lower the risk of unsightly accidents. To avoid cracking the icing, tiers should be stacked while the icing is freshly done. Alternatively, you can wait for at least 2 days after icing the tiers before stacking. The only time full dowelling is not necessary for a stacked construction is if the lower tiers are a firm fruit cake or carrot cake. If a light sponge cake or mousse-filled creation, without the dowels the top tiers would simply sink into the lower ones and the cake will topple over. Utilizing cake boards in a stacked cake not only assists in stabilizing but also makes it much easier to place each tier onto the cake. Purchase or cut the cake boards so they are the same size as the cake layer (or else the board will show). It is also important to make sure the material of the board is sturdy and won't bend easily. For smaller layers—6 inches or less—you can stack 2 cakes on 1 board. Do not try to stack more than 2 layers. Before putting the cake layer(s) onto the board, lightly place the next cake board on top of the previous cake layer to make an outline; this way you will know where to place the dowels, making sure they are actually under the next layer. Creating a stable foundation out of dowels for the cake is not difficult. You can use either wood or plastic dowels depending on what is available or your preference. A good rule of thumb is to use 1 dowel for every 2 inches of cake. For example, a 16-inch or 18-inch cake will require at least 8 dowels and a 10-inch cake will need at least 6 dowels. Plastic dowels tend to be wider than wood ones so you can use fewer plastic dowels in your construction. However, a benefit of wooden dowels is that you can "sharpen" one end into a point, making it easier to puncture the cake and the cake boards. You can sharpen the dowel with a pencil sharpener or even a sharp paring knife. Make sure you do any cutting or shaping away from the cake so there is no risk of sawdust or debris marring the cake. Whether you are using wood or plastic, you should wash and dry the dowels before inserting into the cake. It is also best to cut all of the dowels for each layer before placing any into the cake—this way, you can make sure each dowel is cut to the same length. They should also be inserted straight up and not at an angle. It may be easier to place the dowels in the cake if the cake has been chilled first. When inserting the dowels into the largest tier, you should start by putting one in the center of the cake; then place additional dowels a little inside the circumference where the next tier will sit (so the dowels are below the second tier). Once you have your cake layers and all of your supplies, you are ready to assemble a tiered cake. If you take your time and follow the steps closely, remembering the helpful tips, you are bound to have success. Using icing, "glue" the bottom tier onto a cake board; the bottom tier is usually on a thicker cake board or even a plywood base that is either the same diameter as the cake or at least 2 inches bigger depending on the design. Evenly coat the layer with frosting or icing. Make sure the cake is completely level using a level from the hardware store set on the top. Insert dowels into the bottom layer. Use the cake board for the next layer to gently imprint the outline (centered) on the icing or fondant of the bottom layer. Remove the cake board and use this guideline when inserting the dowels. Insert one of the dowels into the tier (within the marked circle) taking care to go straight down to the cake board. Use a knife to score the dowel at the exact height of the top of the cake and then pull the dowel back out. Cut the dowel the correct length and then cut the remaining dowels for that tier using the first measurement. Insert the dowels into the cake tier, spacing them evenly apart, about 1 inch in from the cake board outline. Push the dowels straight down until each one touches the bottom cake board. Repeat this process with the remaining layers—except the top one—centering them exactly using a palette knife to move it without ruining the icing. Using icing, glue the top layer on a cake board of the same size, ice evenly, and place on the cake. After the cake is stacked completely you can stabilize it further by running a long wooden dowel with a sharpened end through all the cake tiers from the top; the sharpened end should penetrate through each cake board and then embed itself into the base cake board. This will prevent any shifting. If your dowels are not long enough to go through the entire cake it is advisable to stabilize the first 2 tiers on the bottom using this method and then repeat it with the top 2 or 3 tiers.